NT: How did you come here? INT: And where had you come from? INT: Why had your parents allowed you to come? G.S: Well, they could see no future for me. They were frightened of what would happen to me and they themselves couldn’t get out. And they sent all their children – three children. INT: Did you know what was happening to you? G.S: Well, not clearly. I mean, I thought I would see my parents again. I knew I was going to someone I had never seen before but my parents had communicated by letter to the lady, and I knew I was going to a good home but I didn’t know where. INT: Can you understand how it must have felt for your mother? G.S: Well, I think she must have felt absolutely awful. I mean, she, three children you know, disappearing. And she obviously knew that she’d never see them again. Well, it must have been dreadful, dreadful for her. INT: Were you aware, when you were younger and before you left home of other families being parted in this way? G.S: Yes, yes. You know, there was a general exodus. They, most people tried to get their children out even if they couldn’t get themselves out, they tried to get the children going. And, I must say, the British government was quite good about that, at that time. They did take in a lot of children. INT: Were you scared that it was going to happen to you when you saw other children having to leave home? G.S: Yes, and, in a way I sound selfish but I was glad that I had the chance of leaving because I saw such terrible things. You know, I remember coming home from school and seeing an old man having to scrub the floor, the pavement and a whole lot of brownshirts, you know the Nazis, standing round poking him with rifles and oh everybody laughing and jeering. I mean this sort of thing happened and it was, you know, frightening – it was terrible. INT: When you had to move schools were you aware that the kids who were not Jewish were sorry for you? Or were they pleased you were being humiliated in this way do you think? Had they been indoctrinated by the regime? G.S: I don’t think that we, you know, that we had anything more to do with them really. We were just whisked off and that was it. I don’t know what the reaction really was. We had a lot of non-Jewish friends and I don’t really know what the reaction of the children was. I think we had so many worries, I think that was the least of our worries! Whether they would play with us, I don’t know. I think most of the time my mother would keep us in anyway by then, you know because she would be frightened of what they might say. INT: Were you aware then, I mean you say you saw this old man scrubbing the pavement, were you aware of the attacks on Jews? G.S: Oh yes, yes, yes. The thing was that my family didn’t really look Jewish and we didn’t have a Jewish name, I was called Marle. and so I wasn’t so obviously Jewish but anybody who faintly looked Jewish was attacked. You could walk down the street and have people attacking you, jeering. G.S: Yes yes. Spitting at you and that kind of thing. INT: And you remember that very clearly? INT: These were just ordinary people, not soldiers- not brownshirts? G.S: No, no. You see, I’ve always had this feeling. Now everybody pretends the ordinary Austrians, the ordinary Viennese weren’t Nazis – they were all Nazis. If you scratched one of them you found a Nazi underneath. I just don’t believe. Now they pretend they, they were good people but they weren’t. There were very few, the few that were ended up in concentration camps like everybody else. If there were some Catholics who were good and helped some Jews or protested – they were whisked off as well! You know, they. I don’t think there were so many who weren’t Nazis. INT: Do you think a lot of them just joined in because they were scared not to? G.S: Well there must have been some who did that but some enjoyed it. I mean if you, for instance, we had to leave our flat because it was a council flat we lived in. One of those modern flats built in the 30’s by the socialist government there. And, so we had to leave it as soon as the Nazis came and somebody moved in. Well they would be pleased – they wouldn’t worry about us. And we couldn’t.we had to leave all our furniture, piano – everything was left. We just had to leave. It wasn’t a question of ‘would you mind going out?’, we were told ‘You must leave this house by tomorrow or in the middle of the night..’ whatever. You see. INT: So you, you lost everything? G.S: Yes. The only reason we had somewhere to go to was my uncle actually owned the whole house – where my mother and father and brother went to. So that wasn’t taken away until much later. INT: So it went as well? INT: So everything was taken away? G.S: Yes. 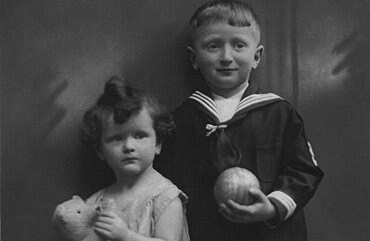 But after the war my sister went back and because he had left a will and the house, half of that house was left to her. But by the time they had paid all the lawyers and everybody she didn’t get anything out of it. INT: And did you manage to rescue any keepsakes from your family? Furniture or anything? G.S: I have a tablecloth that my mother knitted. You know, a lace one. There isn’t really anything. INT: Nothing left at all? No photographs, nothing? G.S: Well that was the sad thing also that we haven’t really. I have a photograph of my parents taken at that time. They look awful, all thin and worn. Dreadful. INT: That’s the only one? INT: Were you aware, at that age, of the political situation in Germany? G.S: Oh yes, yes yes. We were all terribly frightened. I mean, it was really traumatic. I saw my father cry and I’d never seen that before. You know, it was terrible. Really. INT: Do you feel when you look back that when you left them, that they knew that they would never see you all again? G.S: I think they had a jolly good idea that they, you know, that it was on the cards that they wouldn’t see me because, you see, war was declared on the 3rd of September and I’d only just arrived the end of June. It was very short time, you know things looked pretty grim. INT: Do you feel, looking back, I mean -are you bitter that you lost your family in this way? G.S: Well of course I’m very sad about it all. I wish that I could have got my parents out. But it was impossible. They had no money by then and, you know, my father lost his job and there, there was nothing for a Jew to do. You know, it was terrible conditions. We had to leave our house, we had to, the family was split up even before I came, you know, before I came to England. You know, my father, mother and brother lived with an uncle who had a house and they had to share there. My sister lived with someone else in the family, I lived with an aunt – you know, it was all split up already. INT: So it had begun long before you left for Britain? G.S: Oh yes, because there had been a pogrom on November of ’38 and that was dreadful. I mean, I was still there, my sister was already in England. But I was still there and it was frightening, I mean really. INT: Were you forced as a child to identify yourself as a Jewish child? G.S: Oh yes, yes because we had to leave. You see I went to a good grammar school, a girl’s grammar school and no Jew was allowed to go to a grammar school, you see. So we than had to leave en masse from that school and go to an ordinary – what was called Hauptschule. And, but the thing was that some of our teachers were Jewish too so they came as well so we had the same teachers. But you see you weren’t, I did, for instance, in that school you did Latin in the first year, English in the third and then if you stayed on long enough French in the fifth. Well I’d had three years so I was, I had done one year of English and three years of Latin but all this was stopped in this school you see. You were sort of doing arithmetic and German. INT: Much more basic work. In this next section my mother is talking about her journey across from Europe on the Kindertransport boat. INT: You never know – you might find someone who was on the same boat or train or. G.S: That, that could well be. I remember on this boat, of course the children were all frightened, we’d never been on a, well, most of us had never seen the sea before. You know we were all coming from the middle of Europe. And because I was a little bit older than some of the others there was supposed to be, in each cabin there were supposed to be four children – one older one and one younger one. But in mine there were three young ones and me. And they all were crying and being sick and it was pretty ghastly. I sort of gave one my, my container for being sick in and then wondered what I would do if I were to be sick! But it didn’t happen.